Spring, winter, spring, winter... typical weather for this time of year! 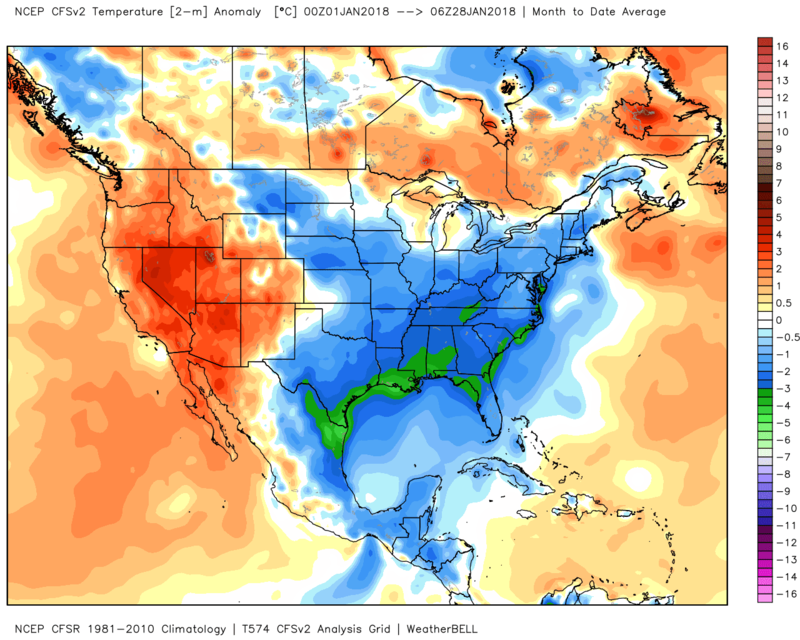 After spending much of the first three weeks of the year in the deep freeze, the past week or so has been much more pleasant overall. 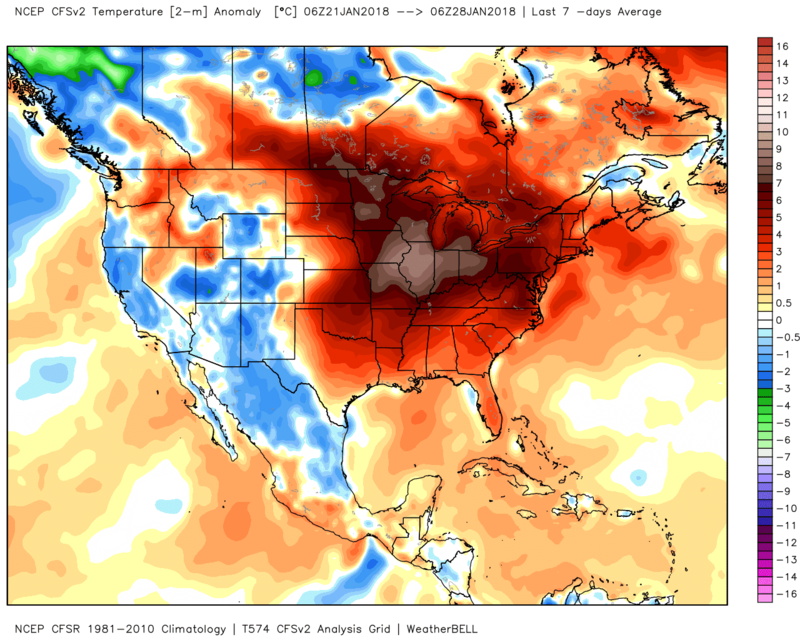 Five of the past eight days saw average temperatures 10° or more above normal, while only one day was below average and that was just by a degree. Overall a nice recovery from a bitterly cold end to 2017 and start to 2018! Today has been gorgeous - more like early March than late January! Sunshine and 60° is always welcome in the "dead" of winter. However, looking ahead things get rather tumultuous in the coming week or so, marked by a very progressive pattern that features a couple of fronts and areas of high pressure that pass by rather quickly, and roller coaster temperatures. 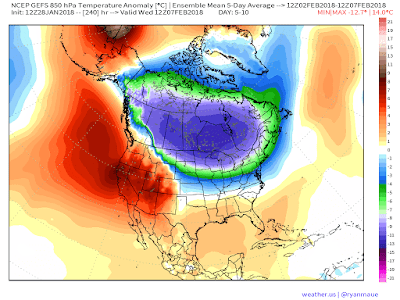 Finally, as we get towards next weekend and the following week, a lobe of the famed "polar vortex" drops into eastern Canada and the northeast sector of the U.S. 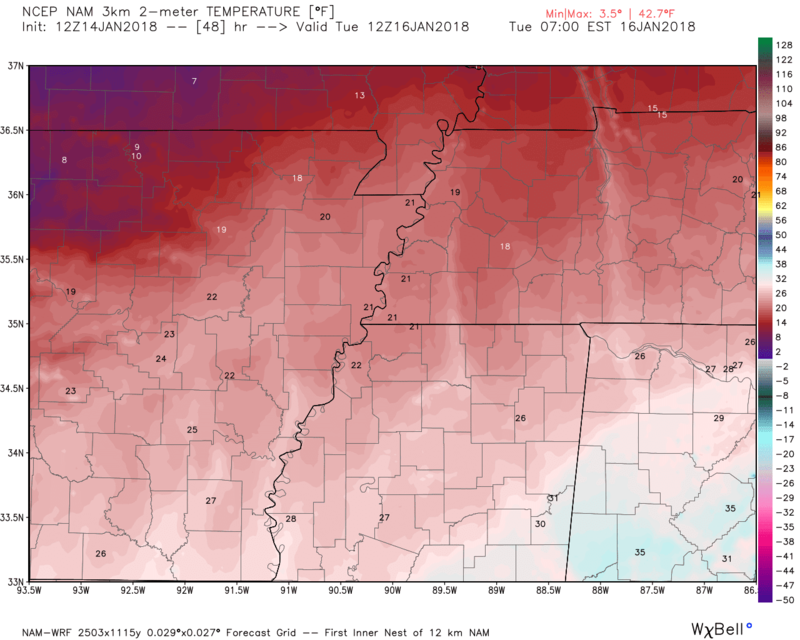 It will bring very cold air to that region, but a muted influence in the Mid-South, where a battleground may set up between the cold to the north and warmer air to the south. A dry cold front that brings some measure of cloud cover to the region, moves quickly through during the early morning hours. This front, though dry, will bring an end to the warm weather we had today as highs don't quite reach the 50° mark. A north breeze will make it feel more like the 30s to near 40. Don't forget the coat you didn't need on Sunday when you head out in the morning! A cold day is in store as high pressure quickly moves through, resulting in less wind and sunny skies, but temperatures that start in the mid 20s and only reach the mid 40s. Wind becomes light under high pressure, then turns southerly Tuesday night as the high slips quickly off to the east. As low pressure develops in the Southern Plains and with the aforementioned high off to our east, steady south breezes and sunshine quickly warm temperatures back up from near 30 as you head to work or school well into the 50s by mid-afternoon. This will likely be the nicest day of the week if you don't count today! 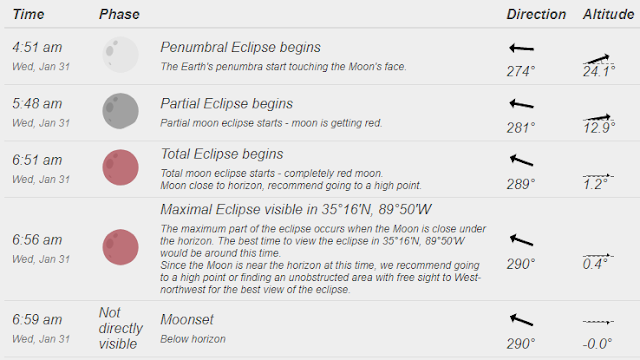 Wednesday morning - total lunar eclipse! 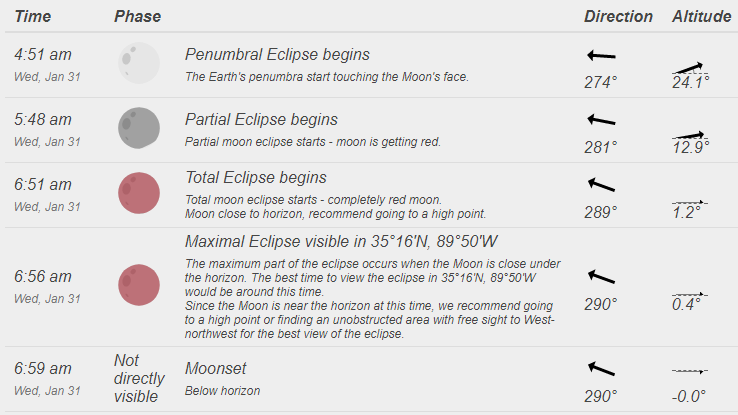 Also of note on Wednesday, a total lunar eclipse will occur just before moonset and as the sun is about to rise. The image below provides the details, but the event will occur low on the western horizon, so if you have trees or buildings blocking your view of the horizon to the west, you likely won't see the total eclipse. The penumbral eclipse will be very hard to notice, but the start of the partial eclipse will be visible to the naked eye (and no eye protection is needed for lunar eclipses!). The moon will be in totality for about 5 minutes before it slips below the horizon. Note that the altitude of the moon at 6:51am is just 1° - you won't see it if you don't have a clear view of the horizon! Sky conditions, however, currently appear to be excellent for viewing. It's also worth noting that this total eclipse is of a supermoon - when it's distance from earth is at its minimum - a "Total Eclipse of a Supermoon!" The low over the Plains moves our way as another cold front slips through during the day. Temperatures will still be near average, perhaps falling by mid-afternoon, but rain chances increase dramatically as we go through the day. As cold air dives in after dark behind the departing system, rainfall starts to push east. 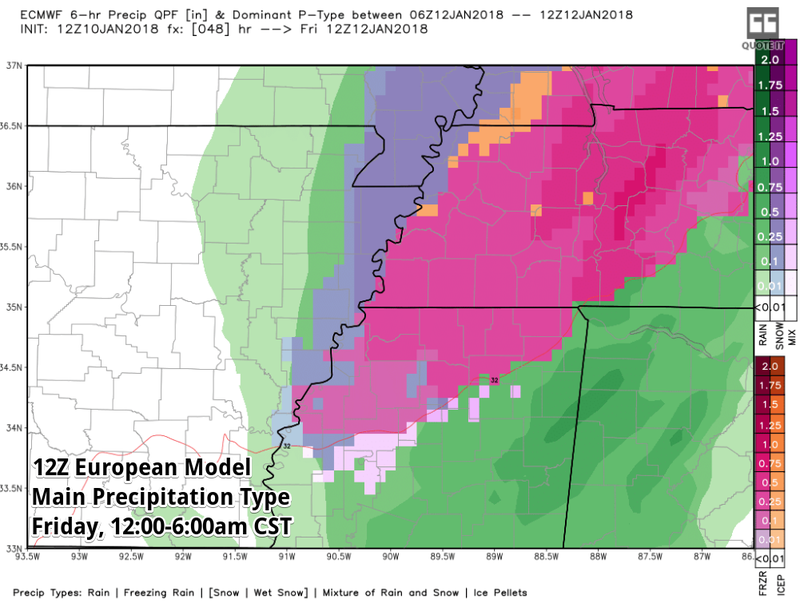 Computer models have been hinting at some frozen precipitation on Thursday night for the past several days, but now seem to be narrowing the chances to just a few short hours before precipitation ends, when it may get cold enough for a bit of snow. I wouldn't hold my breath, as oftentimes the precipitation departs before the "cold-enough" air arrives. Stay tuned to our forecast! It could change as we get closer. Earlier model runs had again hinted at lingering precipitation (likely snow) early on Friday. I find very little chance of that at this point and will go with diminishing clouds and below average temperatures - likely with highs in the 40s and a cold breeze. Again, we'll watch it carefully, but for now it looks dry and cold. Morning lows will be near freezing as the groundhog - or some other flavor of rodent, if you prefer - makes his appearance to tell us about the next 6 weeks. Saturday currently looks dry and a bit warmer as we will probably be between systems again. An average early February day is the best bet. 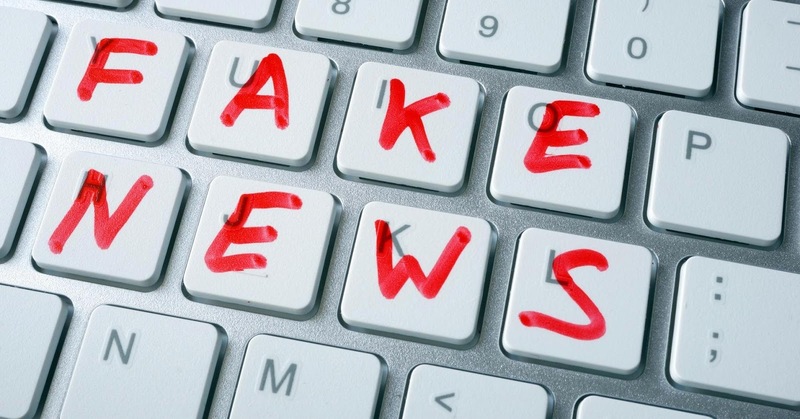 The crystal ball gets foggy after that thanks to a wide range in computer model opinions. 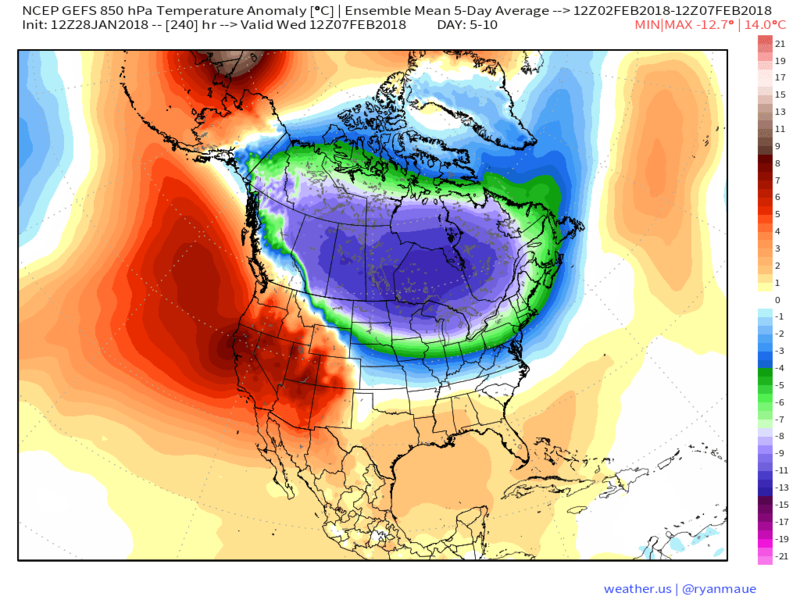 As the polar vortex sets up shop well to our north, the pattern locally could get active with generally below normal temperatures and perhaps above normal precipitation. The first full week will be one to keep an eye on! I make no promises. Stay up to date with the latest local weather conditions, human-generated forecast, and precip-typed radar with the MWN mobile app! Not only do you get the best local weather information in the convenience of an app, you get to support your favorite independent weather source in the Mid-South at the same time! What a deal! You can find more info at the link below. 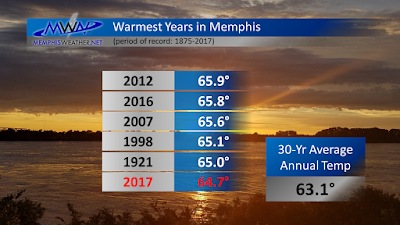 Overall, 2017 was very warm, the sixth warmest in Memphis recorded history, and generally remained below normal precipitation-wise for the year outside of a few wet spells. During the year, there were two major weather events. 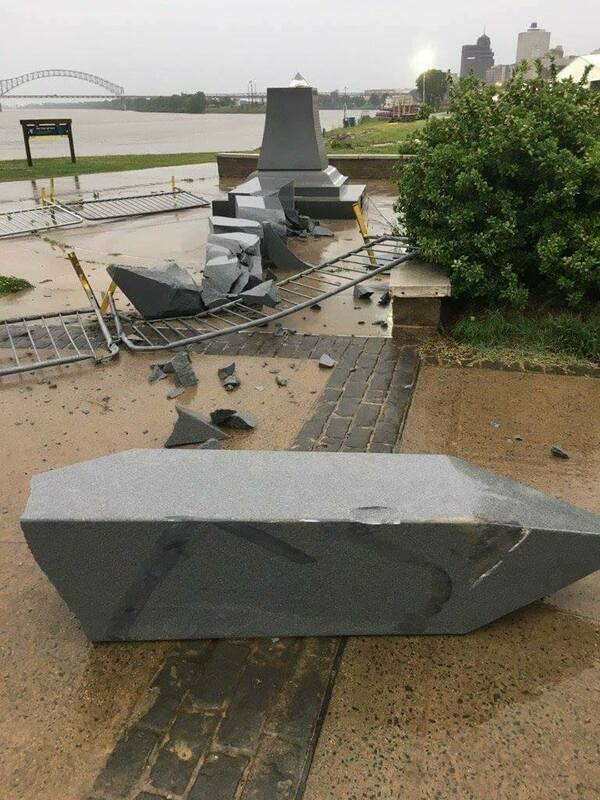 The first was the "Tom Lee Storm," a derecho that struck Memphis on Memorial Day weekend, knocking over the statue of Tom Lee on the Mississippi Riverfront and resulting in massive power outages across the metro due to wind that topped out over 100 mph. 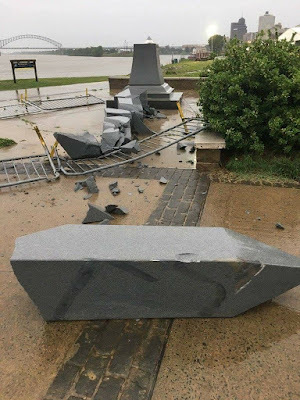 The Tom Lee Memorial Statue lies in pieces after severe windstorm on May 27 blew through the city, less than an hour after Memphis in May's #901Fest ended. Photo credit: Joe Birch. 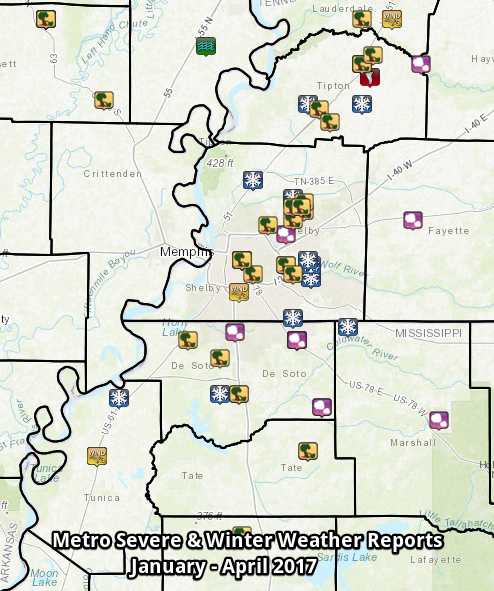 The second was the the passage of the remnants of Tropical Storm Harvey over the Mid-South on August 31, producing record rainfall and very gusty wind, as well as as handful of tornadoes in the region, mainly over northeast MS. 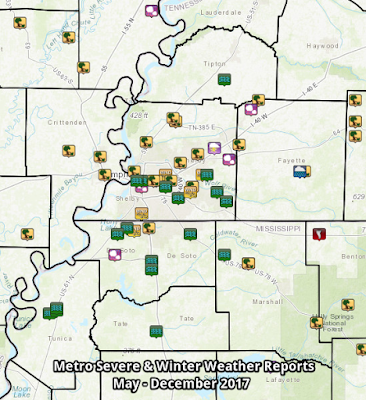 Overall, the Mid-South recorded 27 tornadoes for the year, most weak, while only two occurred in the greater metro: an EF-0 in Tipton County near Covington on April 30 and an EF-0 in Marshall County near Red Banks on June 22. Neither produced any injuries or deaths. The following represents a statistical recap of the weather for 2017 in Memphis. 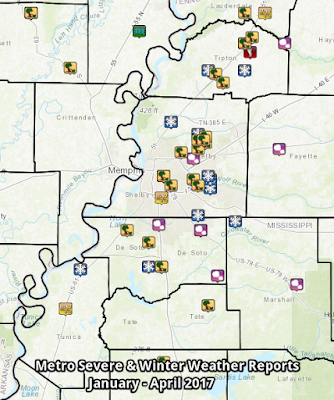 A more complete recap of weather in the Mid-South for the year, produced by the National Weather Service in Memphis, can be found here. 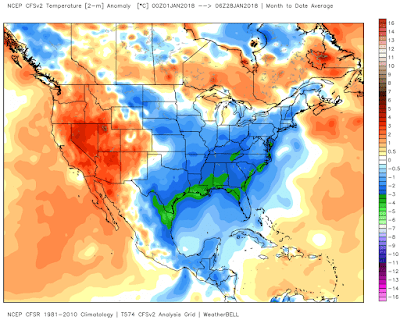 Records set or tied: Six warm weather records and one cold weather record were set during 2017. 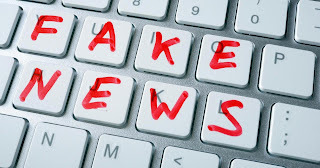 The daily records included: February 11 (79°, record high, and 63°, record warm minimum), February 19 (77°, record high), February 22 (76°, record high), September 12 (66°, record cool maximum), October 9 (92°, record high), and November 5 (67°, record warm minimum). Comments: 2017 was the 6th warmest year on record with a 64.7° average annual temperature. January was the 8th warmest on record, despite featuring the coldest temperature of the year as well. 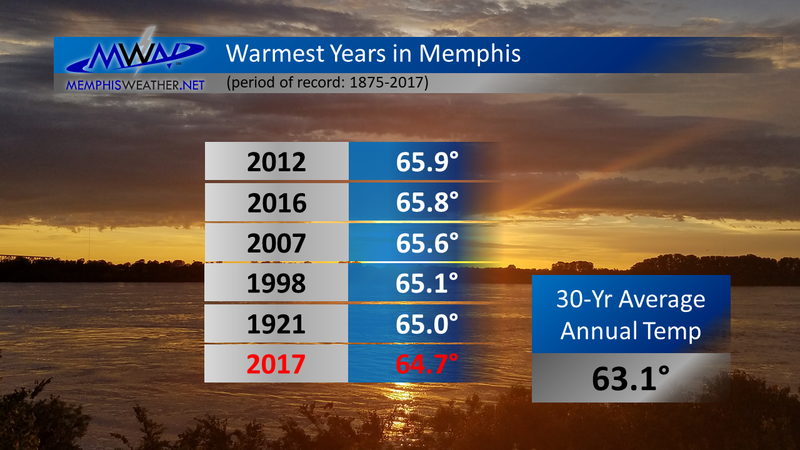 February was the warmest on record in Memphis and ended meteorological winter of 2016-'17 as the 4th warmest on record. April was the tenth warmest on record, landing the period January-April (as well as January-May and January-June) in second spot for warmest such periods recorded. 2016 finished as the sixth warmest year on record in Memphis. 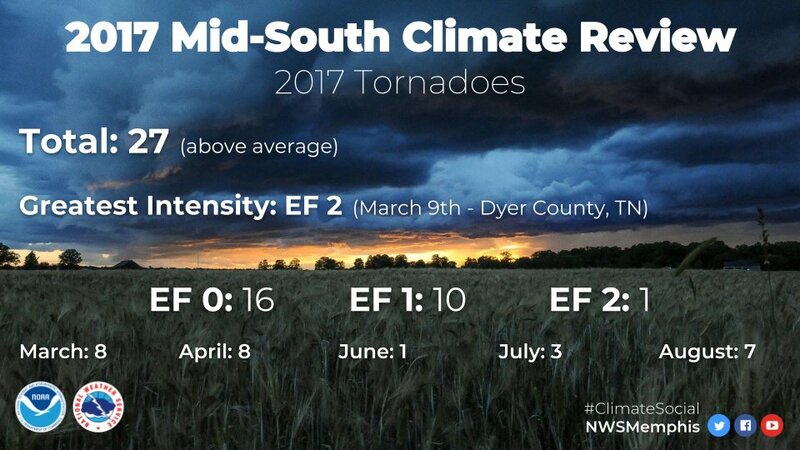 Records set or tied: Three daily records were set in 2017: June 23 (1.63"), August 31 (4.04"), December 22 (3.33"). 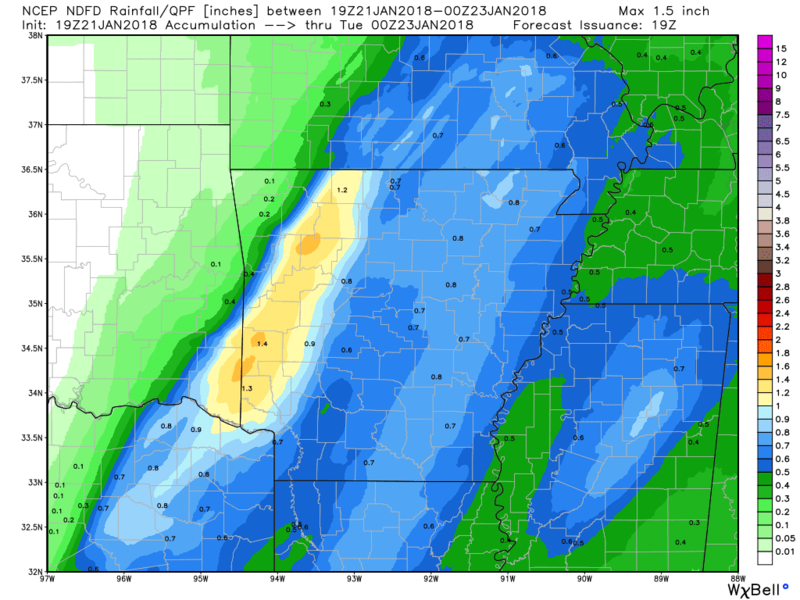 Comments: 2017 ended with slightly below average precipitation for the year. February was the 10th driest on record. August precipitation, particularly from the remnants of Harvey at the end of the month, netted a fourth place finish for wettest on record. Precipitation accumulation for 2017 is plotted as the dark green line, compared with a normal year in brown. For a large part of the year, precipitation ran below average. 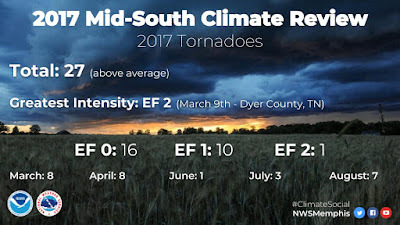 Periodic downpours brought the total closer to average for short periods, particularly around September 1 and in mid-December, but the year ended slightly below normal. Leaving Arctic cold in the rear-view mirror - warmer days ahead! Winter weather is now behind us for a while it appears! I can hear your collective sigh of relief (especially you parents with kids at home most, or all, week!). Warmer temperatures are ahead, starting with this weekend's 60s. Though it won't be quite that warm all week, I think we'll take a good deal of 50s with morning lows near or above freezing. Southerly flow this weekend has done a number on the lingering ice, as have temperatures that have been above freezing since Friday mid-morning. 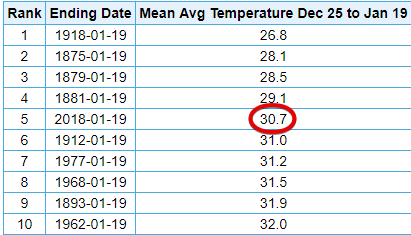 Interesting fact: in the approximately one-week period leading up to when we went above freezing on Friday, only 17 of the previous 173 hours were above freezing! Most of those hours were this past Monday when we had a one-day reprieve from the freezer on MLK Day. 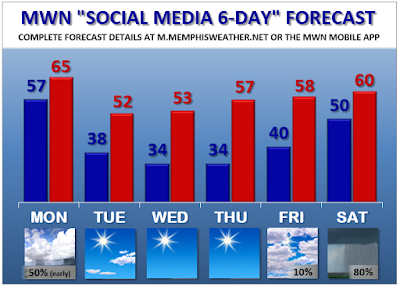 In addition, the period from Christmas Day through January 19 was the coldest such period in a century in Memphis! Listing of the top 10 coldest average temperatures for the period Dec 25-Jan 19. 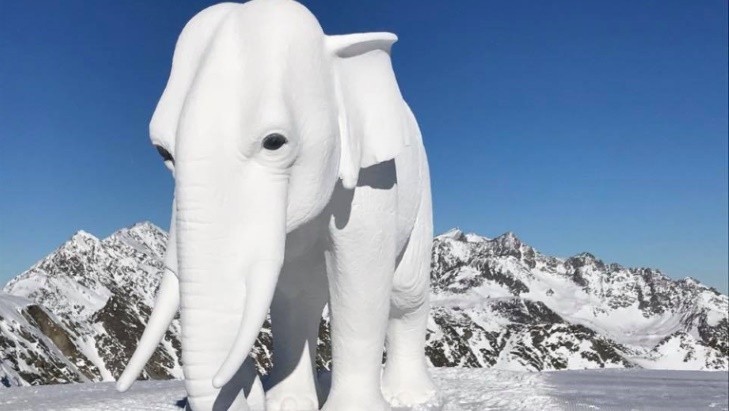 This year was the coldest in 100 years! Looking ahead, another potent cold front arrives overnight tonight. The good news with this one though is that the airmass trailing the front is of Pacific origin, not Arctic origin. That means a bit of a cool down, but no bitterly cold temperatures! The front itself will be running into a greatly-modified airmass from the one we had this past week - warmer, moister, and with a bit of instability. 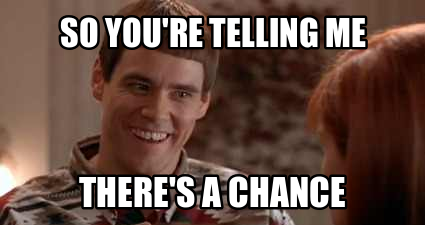 That means we will also have a chance of thunderstorms. 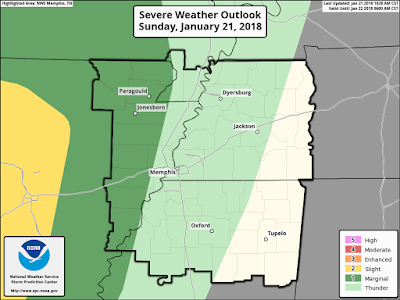 While I don't expect much in the way of severe weather, a few thunderstorms could have some gusty wind, as wind will be blowing strong at all levels of the atmosphere, including down here near the ground. 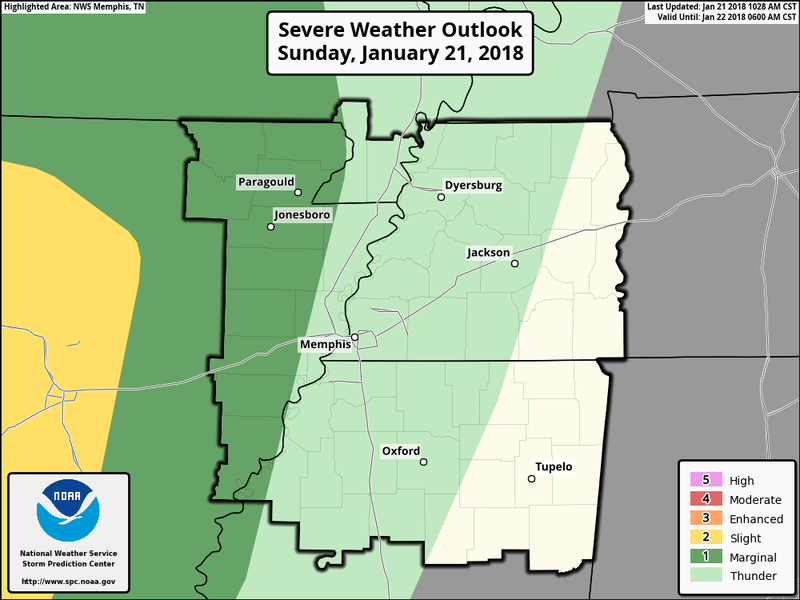 Areas west of the Mississippi River are in the Marginal (category 1/5) severe weather risk for an expected line of rain and embedded thunderstorms that moves through between midnight and 6am Monday. Rainfall totals will likely be under a half inch for most, as the line will be fairly progressive. By mid-morning Monday, the rain will be gone and some sun will be appearing, though a strong southwest wind is also likely throughout the day. Tie down the garbage cans and anything else lightweight that you don't want to lose before retiring for the night tonight! High temperatures will recover nicely on Monday with a fair amount of sunshine and the cooler air trailing the front by a ways. Look for highs again in the lower half of the 60s. For the rest of the week, the cooler air arrives Tuesday with morning lows in the mid 30s and wind chills back into the 20s, recovering back to near 50 in the afternoon. Wednesday will be similar, then a slow warming trend commences again heading towards next weekend, when the next wet weather system arrives. 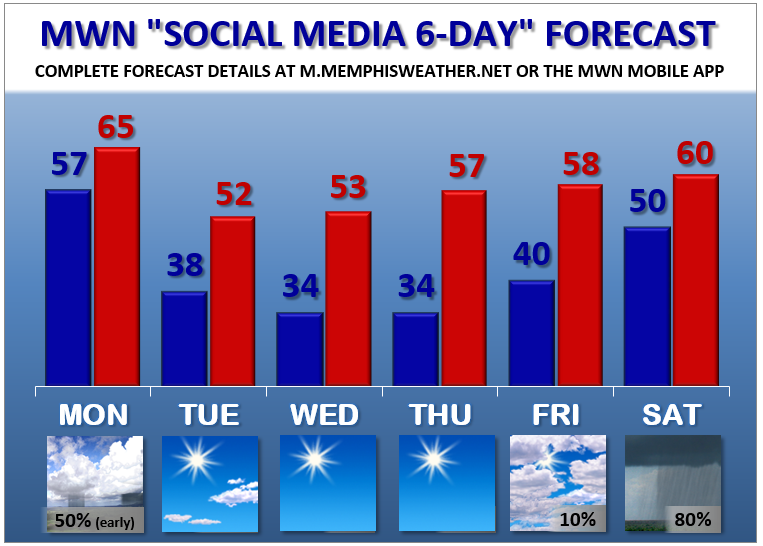 Overall, a good deal of sunshine will be found across the Mid-South though this week! 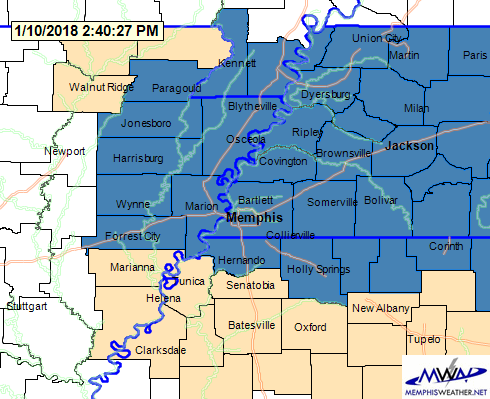 Enjoy the above average temperatures and don't forget you can keep up with the latest information on Memphis weather with the MWN mobile app! Our first winter weather event (and "snow day") is in the rearview mirror, but impacts linger this weekend as bitterly cold air settles over the region. Most areas within the metro ended up with anywhere from 1-1.5" of sleet and snow and very light amounts of ice glaze on Friday. 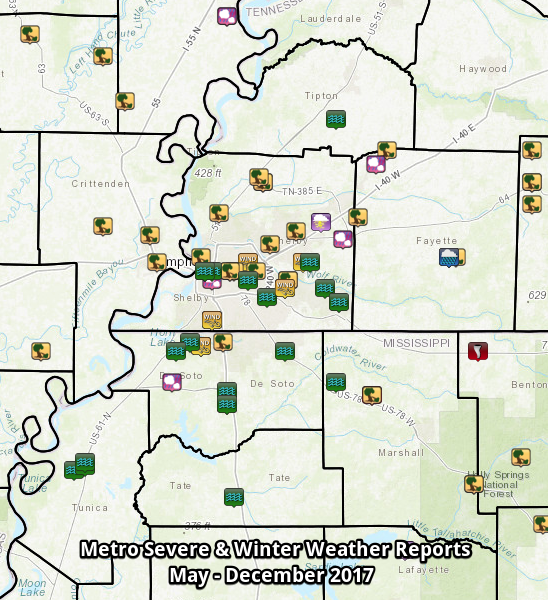 The sleet being the predominant precipitation type resulted in icy roadways, and pretty much everything else. While sun on Saturday aided many areas greatly, despite temperatures remaining below freezing, areas that were wet from melting re-froze last night, with icy patches still around, especially on secondary roadways. Temperatures today will just slide in under the freezing (or melting?) point and with overcast conditions, there will be less progress made on the icy spots. In addition, an upper level wave is bringing light snow to Arkansas and some flurries could make it into the metro this afternoon. Current radar is shown below. Monday will see additional warming that should help a great deal with the remaining ice as high temperatures head for 40° or better with partial sun and southerly wind. However, don't get used to the relative "warmth." 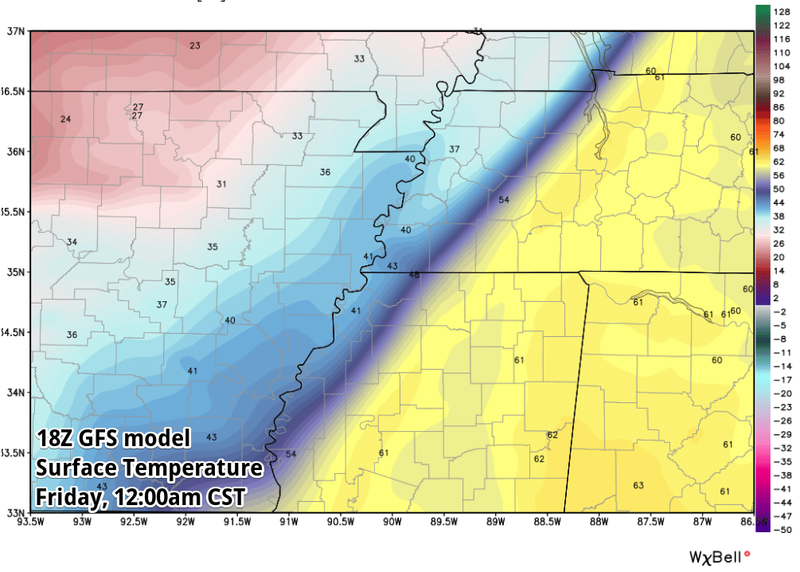 By evening, the next significant push of Arctic air arrives thanks to an annoying Clipper. No, not that annoying clipper... one from Alberta, Canada! 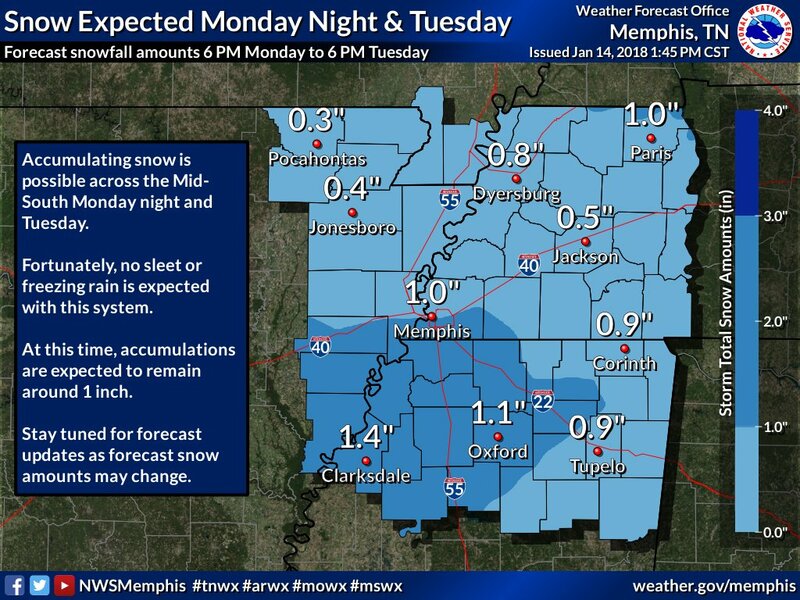 But feel free to "T" this one up too if you want, as it'll bring another round of #StupidCold to the Mid-South by mid-week. (Off-topic: man, I still miss Z-Bo... go ahead, watch that loop a few more times. I digress...) The clipper will also be partially responsible for our next snow event right on its heels Monday night into Tuesday morning. Given that we are still recovering from one snow day and continued impacts, perhaps this one comes #TooSoon? One the plus side: no ice and relatively minor amounts. On the negative side: very cold air results in high snow ratios as we head towards Tuesday morning rush hour. So what do we expect with this system? Temperatures will fall below freezing Monday evening, but the roads will likely retain a little of the daytime heat as light snow begins to fall before midnight, resulting in initial melting and wet streets. As the night goes on, snow chances increase and temperatures continue to drop as Arctic air pours in. 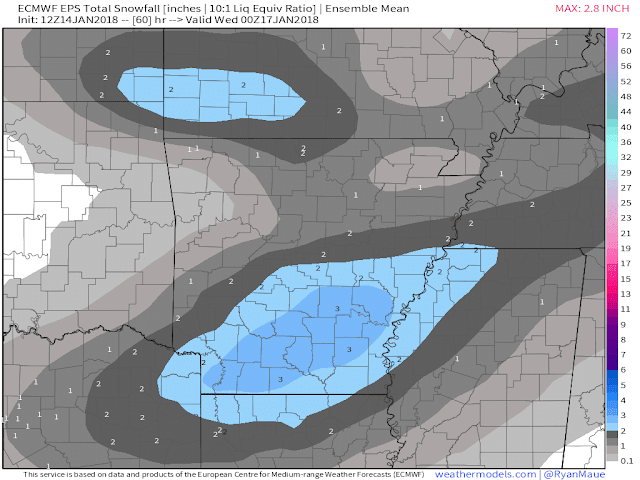 If the European and NAM models are correct, snow appears likely after midnight through about 8-9am Tuesday morning. 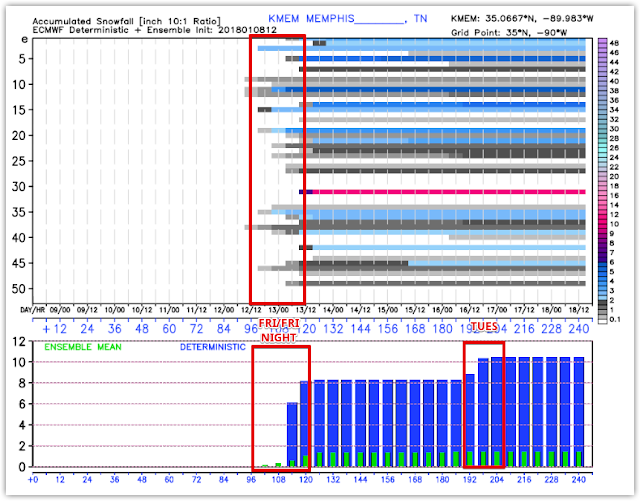 By the time light snow ends, temperatures will likely be near or just below 20°. Snow totals will be strongly affected by the cold air pouring in, causing snow ratios to rise. A snow ratio is the amount of liquid for each inch of snow. 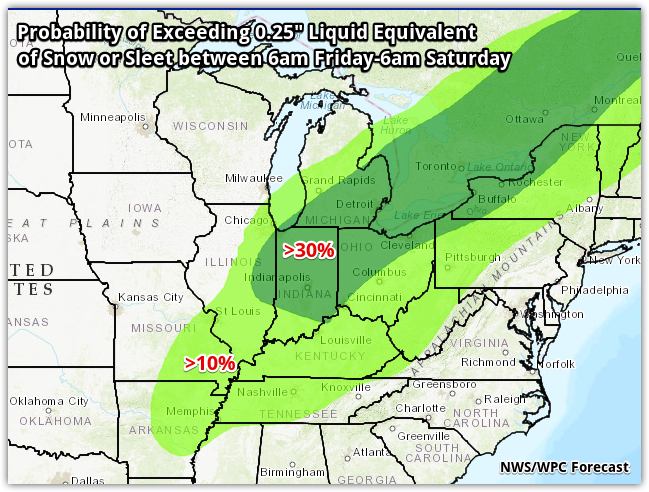 Typically we see roughly 10:1 ratios, which means that for every 1" of liquid, we would receive 10" of snow (or more likely, for every 0.10" of liquid we see 1" of snow). Higher ratios occur in colder air when the snow is drier (think less "pack-able" for snowballs). As our temperatures drop down towards 20°, our snow ratio could exceed 15:1. That means that for the same 0.10" of liquid, we would get 1.5" of snow instead of 1.0". I believe the airport will fare better than Friday's event, mainly because most of the snow falls at a low traffic time and dry snow is much easier to deice than sleet. As always, you'll want to check with your airline if you fly through Memphis on Tuesday and of course allow plenty of time to get to the airport - double your normal travel time, or more. I still won't predict school closings, though this one feels more like a "get up in the morning and see how it looks" kind of event. Friday's was easier with ice predicted during the morning commute. This event is not the same. Road conditions Tuesday morning will likely drive the decision. Once again, with a #StupidCold airmass in place, low temperatures could get down into the upper single digits on Wednesday morning (especially if there is snow cover), and only reach the mid 20s both Tuesday and Wednesday. We won't be back above freezing until mid-day Thursday. Impacts could be prolonged once again. Click here to check the MWN Forecast for this week's temperatures. There always is. In this case, not all models are sold on anything more than a light dusting. In fact, the American GFS model is one of those that is not convinced. I currently favor the European model, which has been very consistent for several days, and in fact, drops more snow than we are currently forecasting (as much as double). 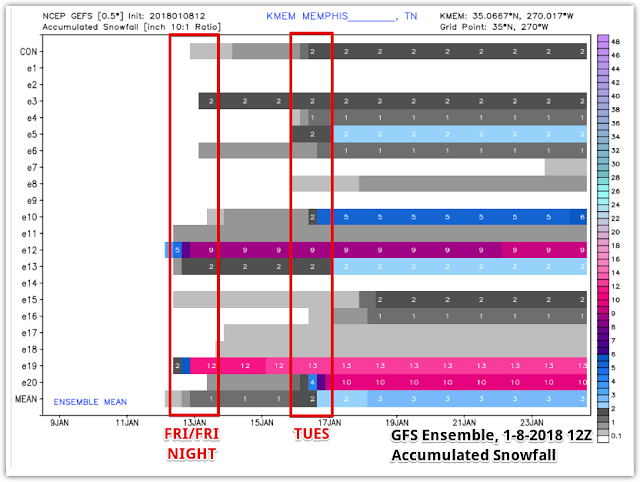 The American-born NAM Nest model, which is much higher resolution and only available out to 60 hours, agrees with the global Euro model, but with a bit less snow. None predict ice, and all are sold on very cold air by Tuesday morning. We'll have the latest on Monday with another blog or perhaps video on Monday night so you can plan accordingly for Tuesday morning. Perhaps a 4-day weekend turns into 5 days?? Time will tell! 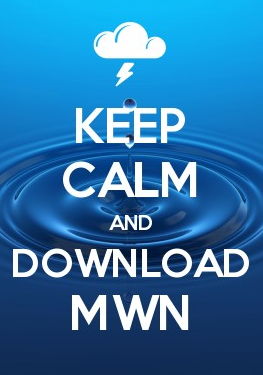 In the meantime, download the MWN mobile app for radar, current conditions, human-generated forecast, and the latest from our social media feeds, which are all also linked below!